It's Party Time At Viva Paso! First off, super sorry about the late notice! Now, on to the exciting stuff. Tonight we are hosting a live painting and hat shaping demo! 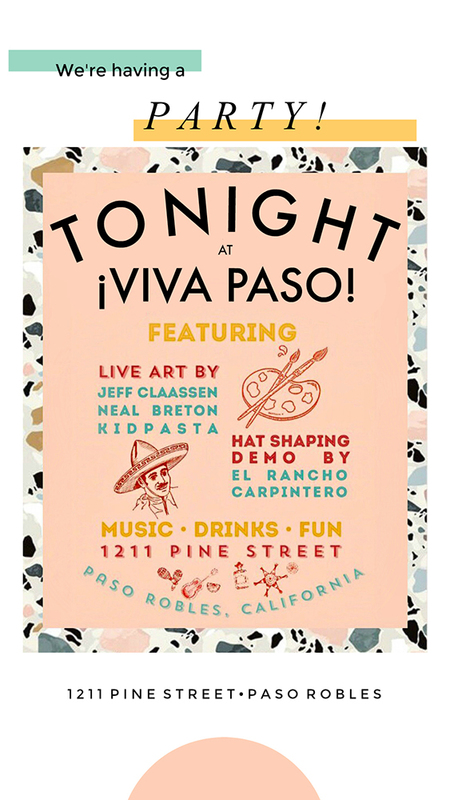 Come see Jeff Claassen, Neal Breton, and Kid Pasta create their next masterpiece and watch Justin from El Rancho Carpintero shape hats right before your eyes. These four artists will be at Viva Paso on Aug. 17 from 6-9pm. If you've ever seen a painting and wondered what went through the artists mind to create it, now is your chance to see that creative process unfold. As for shaping hats, Justin can give you the whole history of hats in the days of Alta-California. The artists will be painting, but are eager to talk and share their process with you. Feel free to ask questions or watch from a distance like a voyeuristic fly on the wall. We will have some tasty treats on hand and look forward to seeing you. Be sure to check out everybody on the IG! Copyright © 2018 Claassen Gallery, All rights reserved.